In the previous part of the C++ Async Development (not only for) for C# Developers we looked at exception handling in the C++ Rest SDK/Casablanca. Today we will take look at cancellation. However, because in C++ Rest SDK cancellation and exceptions have a lot in common I recommend reading the post about exception handling (if you have not already read it) before looking at cancellation. One noteworthy thing in the code above is that the pplx::cancellation_token_source variable is captured by value. This is possible because pplx::cancellation_token_source behaves like a smart pointer. It also guarantees thread safety. All of this makes it really easy to pass it around or capture it in lambda functions in this multi-threaded environment. In the code above the first task cancels the token. This results in canceling its continuation because we pass the cancellation token when scheduling the continuation. This is pretty straightforward. The important thing, however, is to also look at what happens on the main thread. In the previous example we called pplx::task::get(). We did this merely to block the main thread from exiting since it would kill all the outstanding threads including the one our task is running on. Here we call pplx::task::wait(). It blocks the main thread until the task reaches the terminal state and returns the status telling whether the task ran to completion or was cancelled. Note that if the task threw an exception this exception would be re-thrown from pplx::task::wait(). If this happens we need to handle this exception or the application will crash. Finally, for the completeness, we also have code that gets the result of the task (t.get()). It will never be executed in our case since we always cancel the task but in reality more often than not the task won’t be cancelled in which case you would want to get the result of the task. – What happens if we don’t call pplx::task::wait()/pplx::task::get() and the task is cancelled? Sometimes we want to start an activity in the “fire-and-forget” manner and we don’t really care about the result so calling pplx::task::wait()/pplx::task::get() does not seem to be necessary. Unfortunately this won’t fly – if you call neither pplx::task::wait() nor pplx::task::get() on a task that has been cancelled a pplx::task_canceled exception will be eventually thrown which will crash your app – the same way as any other unobserved exception would do. This is mostly it. There is one more topic related to cancellation – linked cancellation token sources but it is beyond the scope of this post. I believe that information included in this post should make it easy to understand how linked cancellation token sources work and how to use them if needed. (the “for C# Developers” part – Note that in the .NET Framework 4 UnobservedTaskExceptions would terminate the application. It was later changed in .NET Framework 4.5 where UnobservedTaskExceptions no longer terminate applications (it is still recommended to observe and handle exceptions though). The behavior in C++ async with Casablanca is more in line with the .NET Framework 4 – any unobserved exception will eventually lead to a crash). One very important thing to notice is that the continuation I added takes pplx::task<void> as the parameter. This is a so called “task based continuation” and is different from continuations we have seen so far which took the value returned by the previous task (or did not take any parameter if the previous task was void). The continuations we had worked with before were “value based continuations” (we will come back to value based continuations in the context of exception handling shortly). With task based continuations you don’t receive the result from the previous task but the task itself. Now you are in the business of retrieving the result yielded by this task. As we know from the previous post the way to get the result returned by a task is to call .get() or .wait(). Since exceptions are in a sense also results of executing a task if the task threw calling .get()/.wati() will result in rethrowing this exception. We can then catch it and handle and thus make the exception “observed” so the process will no longer crash. When I first came across this pattern it puzzled me a bit. I thought ‘.get() is blocking and I use async to avoid blocking so isn’t it a contradiction?’. But then I realized that we are already in a continuation so the task has already been completed and .get() is no longer blocking – it merely allows to get the result of the previous task (be it a value or an exception). (One thing to notice – since the continuation we inserted now returns int (or actually pplx::task<int> – there are some pretty clever C++ tricks used to allow returning just a value or (just throwing an exception) even though the .then() function ultimately returns a pplx::task<T> or pplx::task<void>) the task valued continuation now has to take a parameter of pplx::task<int> type instead of pplx::task<void> type). If you run the above code the result will be exactly as from the previous example. Why? When a task throws an exception all value based continuations are skipped until a task based continuation is encountered which will be invoked and will have a chance to handle the exception. This is a big and a very important difference between task based and value based continuations. This also makes a lot of sense – something bad happened and in value based continuations you have no way of knowing that it did or what it was since you have no access to the exception. There is also nothing to pass if the previous task would return something were there not for the exception. As a result executing value based continuations if nothing has happened would be plainly wrong. Now instead of throwing an exception we return a faulted task. This task is then passed to our task based continuation which can now handle the exception. That’s it for today. Next time we will look at cancellation. The output shows that .get() did the job – once the .get() method was reached the main thread was blocked waiting for the task to complete and then when the task finished the main thread was unblocked. This is great but can we take it to the next level – for instance – can we return a value from the task? This is actually quite easy – to do that you just need to return the value from the task. In our case we can return how much time (in nanoseconds) our task took to execute. We will use types from the std::chrono namespace so don’t forget to add #include <chrono> – I am leaving includes out for brevity. task completed in 2003210000 ns. task completed in 2004 ms.
That’s pretty much it for today. Next time we will look at different types of continuations, exception handling and possibly cancellation. Warning: Some examples in this post belong to the “don’t do this at home” category. and the class from the previous example. If you have not found it yet look at how we capture variables. Before we captured the this pointer explicitly but now we don’t do it. So, we should good, right? Not so fast. If you look at the lambda body you will see we are still accessing the m_x variable. This is a class variable and class variables cannot be accessed without having an instance of the class the variable is a member of. So, what happened is that when we captured variables implicitly the compiler captured the this pointer because we used a class variable in the lambda body. Since the this pointer is always captured by value the new class has the same problem as the previous one. To make things even more interesting the result would be exactly the same if we captured variables implicitly by reference (e.g. if we used [&] to capture variables). This is because the compiler notices that we use class variables in our lambda and therefore the this pointer needs to be captured. However the this pointers is always captured by value (notice that [&this] won’t compile) so even though we used [&] to request capturing variables by reference the this pointer was still captured by reference. If you think that the scenarios shown above rarely happen in real life you might be right. However the “real life” is a bit different when doing things asynchronously. In this case lambdas represent tasks that are to be run sometime in the future. In general you have little or no control over how or when these tasks will be run (there are some advanced settings you can pass when scheduling a task which may give you some control – I have not investigated them yet). Basically, when a thread becomes available a scheduled task will be run on this thread. This means that the task (i.e. the lambda) will run completely independently on the code that scheduled it and there is no guarantees that the variables captured when creating a task will be around when the task actually runs. As a result you can encounter scenarios similar to the ones I described above quite often. So, what to do then? Over the past few months I developed a few rules and patterns which are helpful in these situations. This is probably a little controversial but I like to capture variables explicitly by listing them in the capture list. This prevents from introducing a bug where I capture the this pointer implicitly and use it even though I don’t have a guarantee that it will be valid when the lambda is invoked. This rule has unfortunately one drawback – sometimes after I refactor the code I forget to remove from the capture list a variable that is no longer used in the lambda. In general, if you understand when not to use the this pointer in your lambda you should be fine capturing implicitly. Sometimes you may want to capture by reference only to avoid copying. It is a valid reason and it is fine as long as you can guarantee that the variable captured in the closure outlives the closure itself. Otherwise it is better to be slower and correct instead of faster and return invalid results or crash. Now instead of capturing the this pointer we copy the value of the class variable to a local variable and we capture it by value. This works in simple cases where we don’t modify the variable value in the lambda and don’t expect the variable to be modified between it was captured and the lambda was invoked. Oftentimes this is however not enough – we want to be able to modify the value of the variable captured in the closure and be able to observe the new value. What do we do in these cases? Notice that we create a shared_ptr variable and capture it by value. When a shared_ptr is passed by value its internal ref count is incremented. This prevents from deleting the value the pointer points to. When the pointer goes out of scope the ref count is decremented. Once the ref count reaches 0 the pointer deletes the variable it tracks. In our case we create a closure (the ref count is incremented) and return it to the caller. The caller may extend its lifetime (e.g. by returning it to its caller) or can just invoke it and let it go out of scope. One way or another the closure will eventually go out of scope and when this happens the ref count will be decremented and – if no one else is using the shared_ptr – the memory will be released. One thing worth noting is how using shared_ptrs plays nicely with the previous rule about capturing variables by value. A word of precaution. One general thing you need to aware of when using shared_ptrs is circular dependencies. If you create a circular dependency between two (or more) shared_ptrs their ref counts will never reach 0 because each shared_ptr is always being referenced by another shared_ptr. As a result the instances the shared_ptrs point to will never be released causing a memory leak. If you cannot avoid a dependency like this you can replace one of the shared_ptrs with a weak_ptr which will break the cycle. weak_ptrs similarly to shared_ptrs can be passed by value so they are easy to use with lambda functions. If you have a weak_ptr and you need a shared_ptr you just call the weak_ptr::lock() function. Note that you need to check the value returned by the weak_ptr::lock() function since it will return an empty shared_ptr if the instance managed by shared_ptr was deleted because all the strong references were removed in the meantime. This post was quite long and heavy but knowing this stuff will be very helpful later when we dive in the actual async programming which I think we will start looking into in the next part. 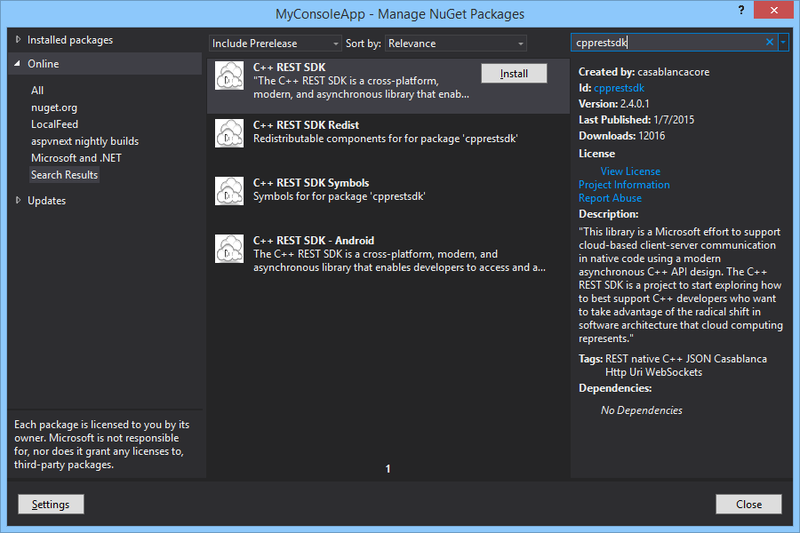 I was recently tasked with implementing the SignalR C++ client. The beginnings were (are?) harder than I had imagined. I did some C++ development in late nineties and early 2000s (yes I am that old) but either I have forgotten almost everything since then or I had never really understood some of the C++ concepts (not sure which is worse). In any case the C++ landscape has changed dramatically in the last 15 or so years. Writing tests is a common practice, standard library became really “standard” and C++ 11 is now available. There is also a great variety of third party libraries making the life of a C++ developer much easier. One of such libraries is cpprestsdk codename Casablanca. Casablanca is a native, cross platform and open source library for asynchronous client-server communication. It contains a complete HTTP stack (client/server) with support for WebSockets and OAuth, support for JSon and provides APIs for scheduling and running tasks asynchronously – similar to what is offered by C# async. As such cpprestsdk is a perfect fit for a native SignalR client where the client communicates over HTTP using JSon and takes the full advantage of asynchrony. I am currently a couple of months into my quest and I would like to share the knowledge about C++ asynchronous development with the cpprestsdk I have gained so far. My background is mostly C# and it took me some time to wrap my head around native async programming even though C# async programming is somewhat similar to C++ async programming (with cpprestsdk). Two things I wish I had had when I started were to know how to translate patterns used in C# async programming to C++ and what the most common pitfalls are. In this blog series I would like to close this gap. Even though some of the posts will talk about C# quite a lot I hope the posts will be useful not only for C# programmers but also for anyone interested in async C++ programming with cpprestsdk. Preamble done – let’s get started. Cpprestsdk relies heavily on C++ 11 – especially on newly introduced lambda functions. Therefore before doing any actual asynchronous programming we need to take a look at and understand C++ lambda functions especially that they are a bit different (and in some ways more powerful) than .NET lambda expressions. The different kinds of brackets one next to each other in the C++ lambda function may seem a bit peculiar (I saw some pretty heated comments from long time C++ users how they feel about this syntax) but they do make sense. Let’s take a look what they are and how they are used. How does this compare to C# lambda expressions? In C# all variables are implicitly captured by reference (so it is an equivalent of [&] used in C++ lambda functions) and you have no way of changing it. You can work around it by assigning the variable you want to capture to a local variable and capture the local variable. As long as you don’t modify the local variable (e.g. you could create an artificial scope just for declaring the variable and defining the lambda expression – since the variable would not be visible out of scope it could not be modified) you would get something similar to capturing by mutable value. This was actually a way to work around a usability issue where sometimes if you closed over a loop variable you would get unexpected results (if you are using Re# you have probably seen the warning reading “Access to foreach variable in closure. May have different behaviour when compiled with different versions of compiler.” – this is it). You can read more about this here (btw. the behavior was changed in C# 5.0 and the results are now what most developers actually expect). Parenthesis are used to define a formal parameter list. There is nothing particularly fancy – you need to follow the same rules as when you define parameters for regular functions. Again something that was not needed for the “simplest possible C++ lambda” example but I think you will encounter it relatively quickly when you start capturing variables by value. By default all C++ lambda functions are const. This means that you can access variables captured by value but you cannot modify them. You also cannot call non-const functions on variables captured by value. Prepending lambda body with the mutable keyword makes the above possible. You need to be careful though because this can get tricky. For instance what you think the following function prints? – congratulations – you were right and you can skip the next paragraph; otherwise read on. As you can see the lambda_by_value_counterpart() function not only looks almost the same as the original lambda_by_value() (except that instead of defining the lambda inline we create the lambda class) but it also prints the same result. This shows that when you define a lambda the compiler creates a structure for you that maintains the state and is used across lambda calls. Now also the mutable keyword should make more sense. If, in our lambda class the operator() function was actually const we would have not been able to modify the class variable x. So the function must not be const or the class variable x must be defined as (surprise! )… mutable int x;. (In the example I decided to make the function operator() non-const since it feels more correct). Since C++ lambda definitions contain full type specifications for parameters and the return type you can use auto and leave it to the compiler to deduce the type of the lambda variable. In fact I don’t even know how to write the type of the lambda variable explicitly (when I hover over the auto in Visual Studio it shows something like class lambda void () mutable->void but this cannot be used as the type of the variable). In C# you cannot assign a lambda expression to var for several reasons. You can read up why here. That’s more or less what I have learned about C++ lambda functions in the past few weeks apart from… common pitfalls and mistakes I am thinking about writing about soon.